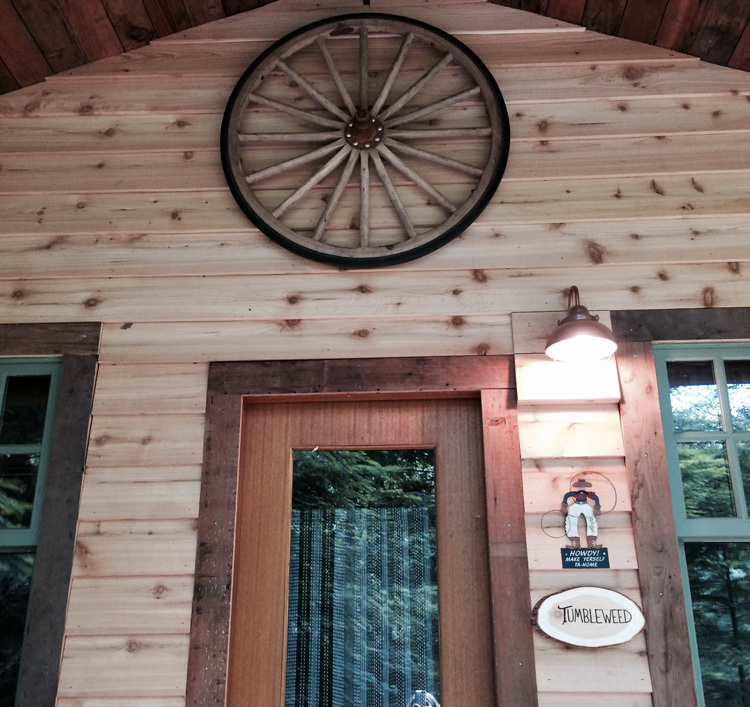 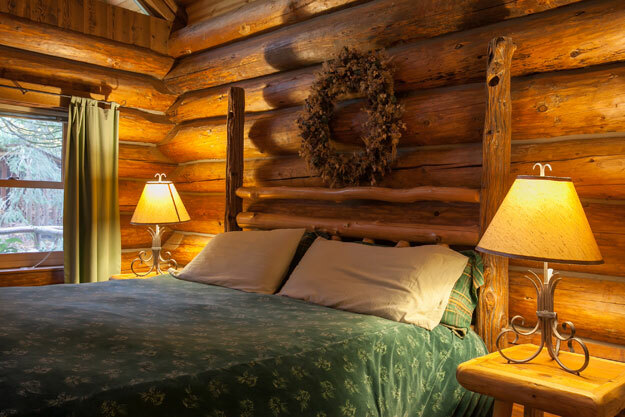 TAMARACK, TIETON, & TIOGA: Wellspring’s newest log cabins are sure to set the standard in the rustic luxury category. 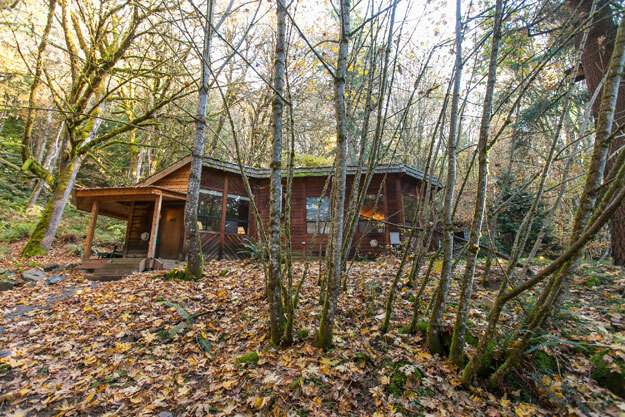 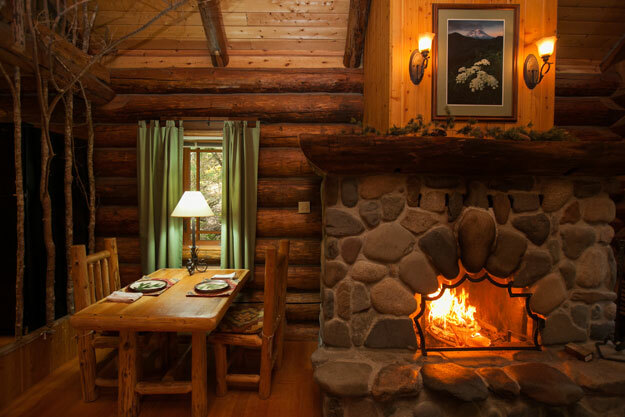 Combining all the elements that make a weekend getaway a dream vacation, these cabins feature handcrafted king feather beds set before massive river rock fireplaces, jacuzzi tubs for two, and full kitchens with fridge, toaster and gas stove/oven. 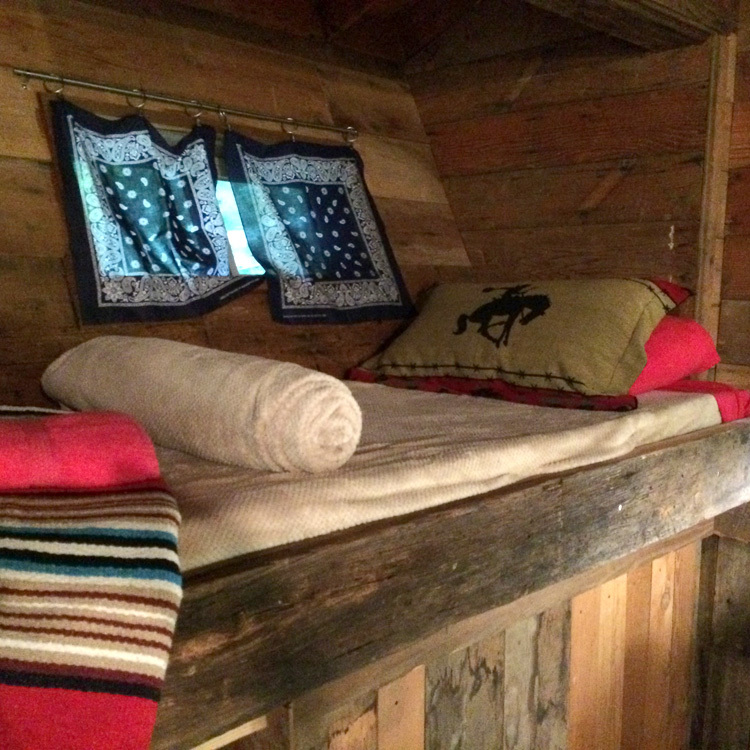 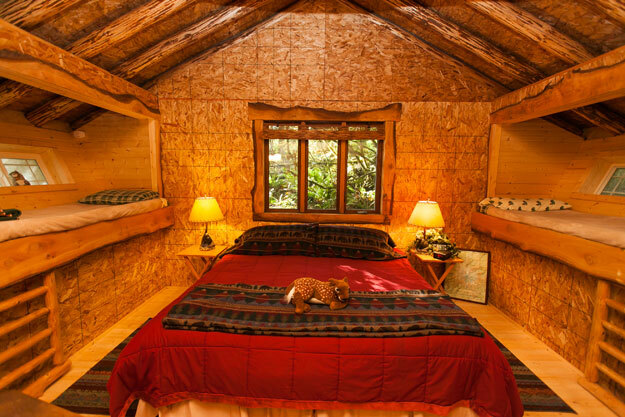 Larger than our classic log cabins, these feature a loft perfect for meditation or an afternoon nap in the hammock. 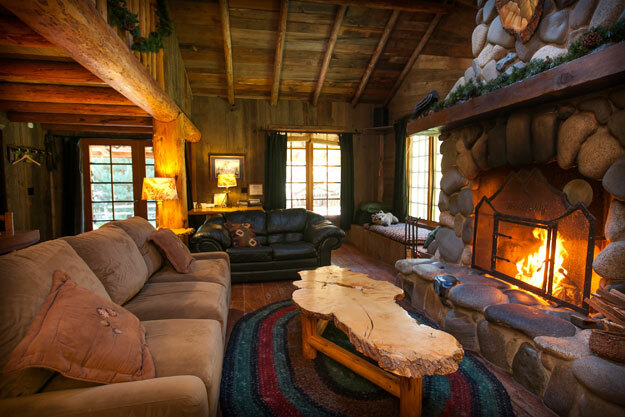 The ideal setting for any occasion, for you and that special someone. 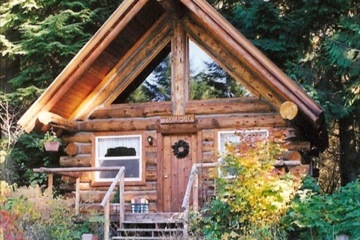 $195 ($215 as of 5/1/19) plus tax. 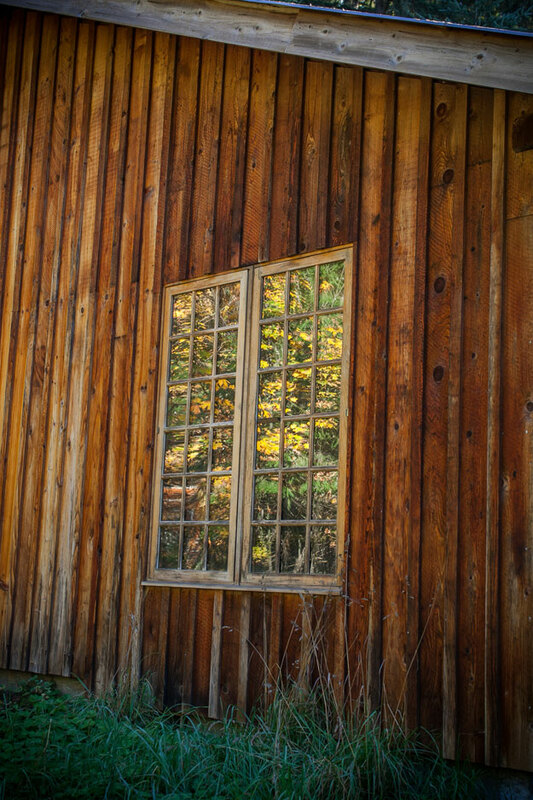 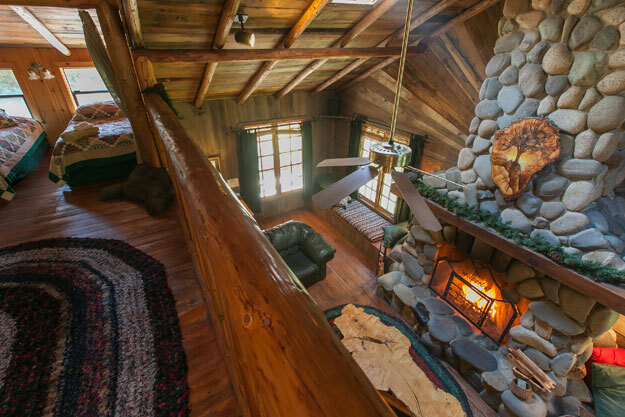 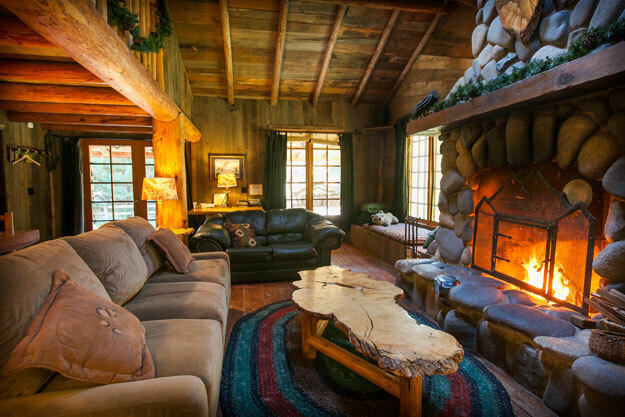 TENAYA, TAHOMA & TUOLUMNE: Each of these classic log cabins evokes childhood memories of woodland fairy tales. 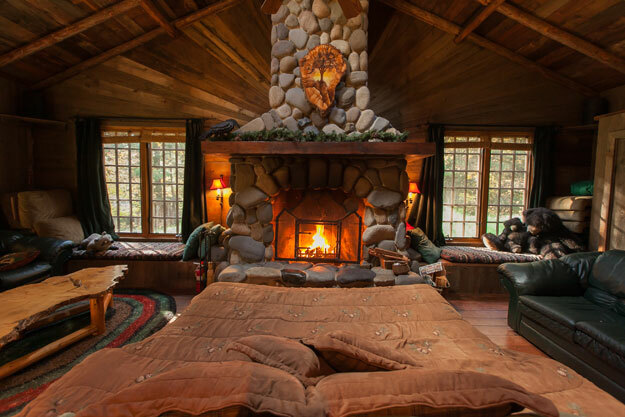 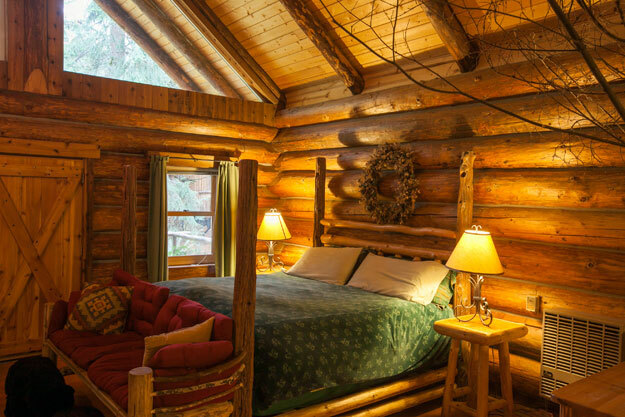 Behind high peaked windows & robust log construction awaits the comfort of queen feather beds and the warmth & romance of glass-fronted fireplaces. 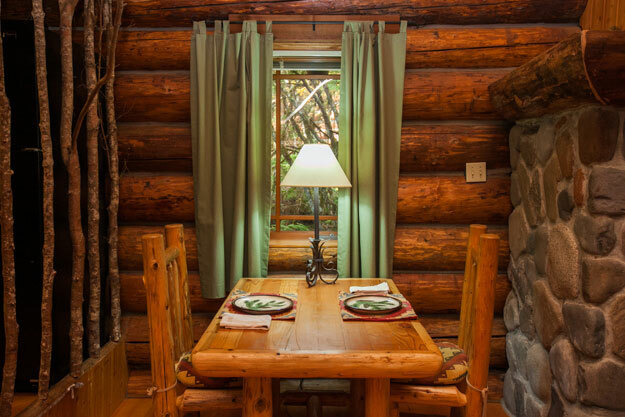 Private bathroom, sitting area, bar size refrigerator, coffee maker, simple dishware and microwave. 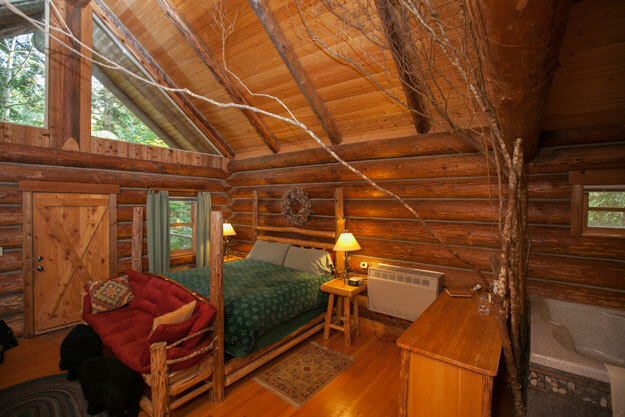 Double occupancy rate of $155 plus tax. 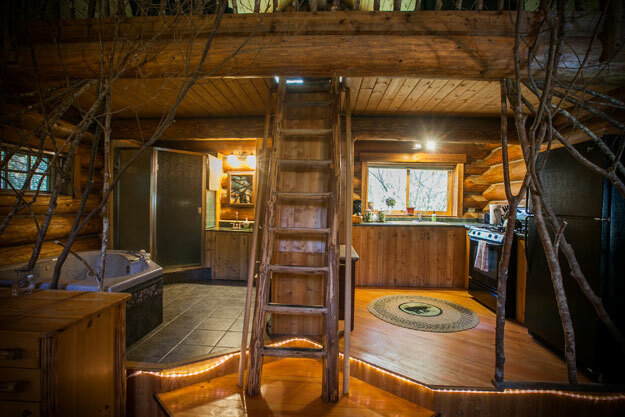 When Baby Bear left the nest and Mom and Pop moved to a smaller den, Wellspring inherited their family cottage. 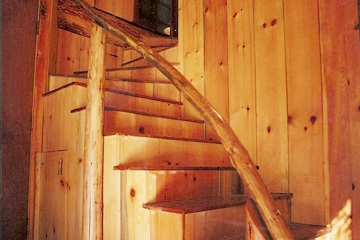 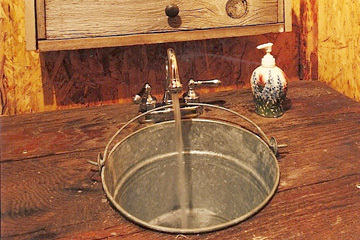 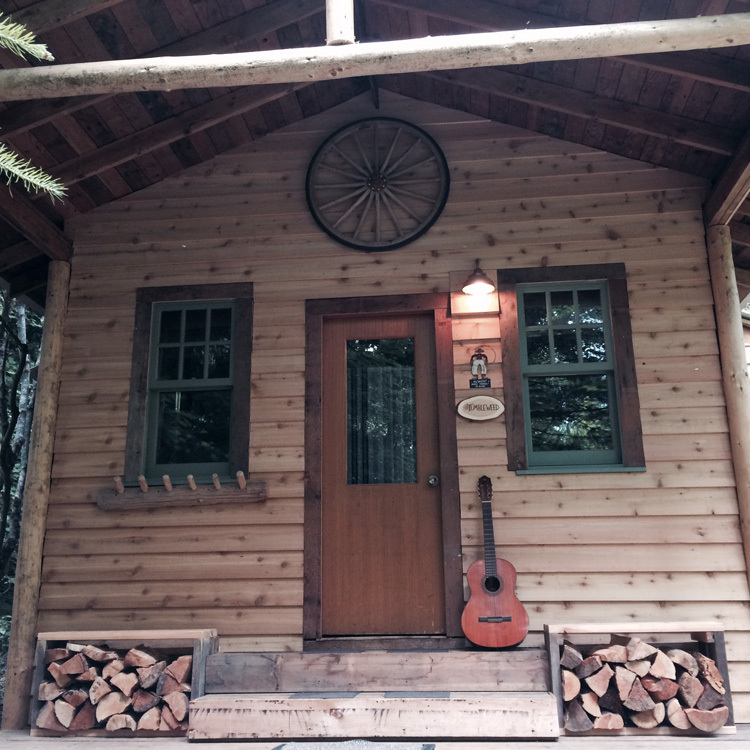 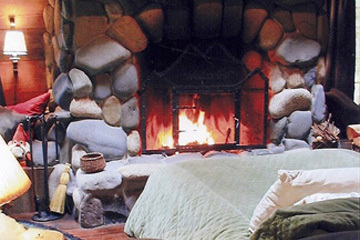 Decorated with pine paneling and unique log furniture, the rustic cottage interior includes a Mama-bear size kitchen, with fridge, toaster, stove/oven and microwave, living and dining room, wood-stoves, private bedroom with four-poster bed, private bathroom with shower, jetted tub and even a washer and dryer. 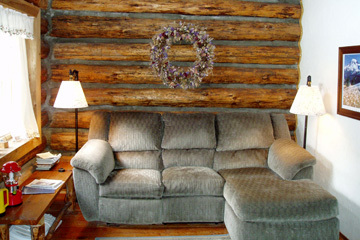 Fold-out couch with foam mattress “just right” for your Baby Bear or even Goldilocks. 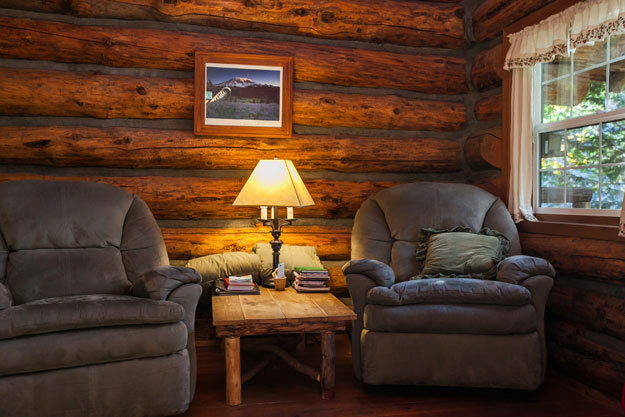 $175 plus tax for three ($185 as of 5/1/19). 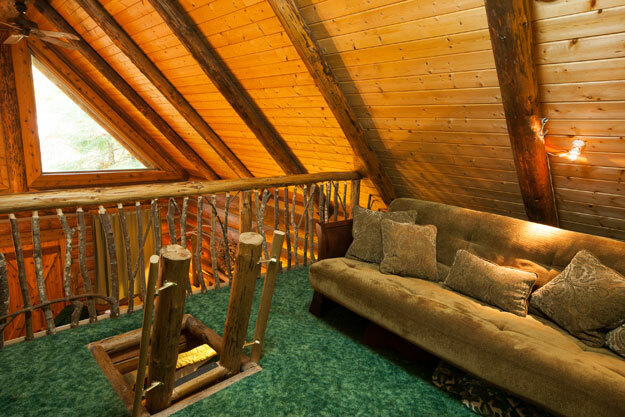 $15 for any extra cubs over twelve years. 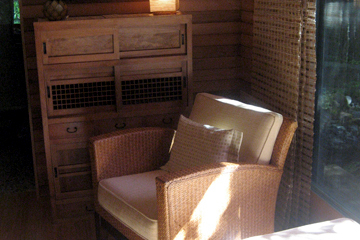 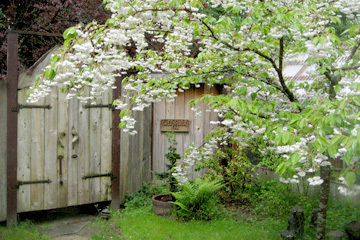 The Grace West Room is a comfortable state room located in a private wing of the Woodland Spa. 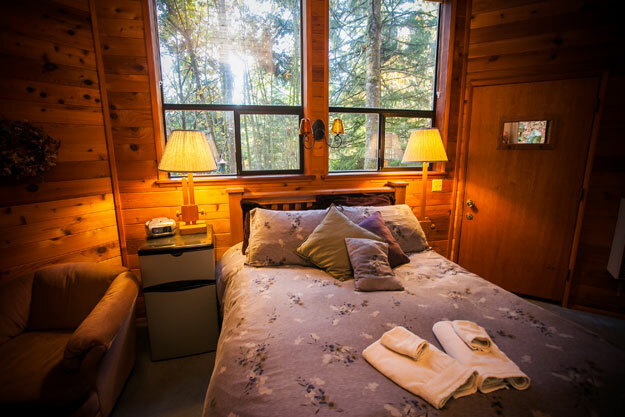 The Grace West Room features windows with forest views on three sides, a queen bed with a feather mattress and a small writing desk. 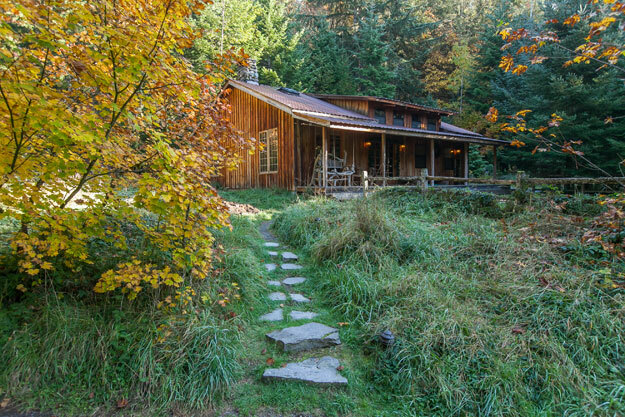 A private porch faces a small waterfall that spills out of the woodland pond and looks out to the forest. 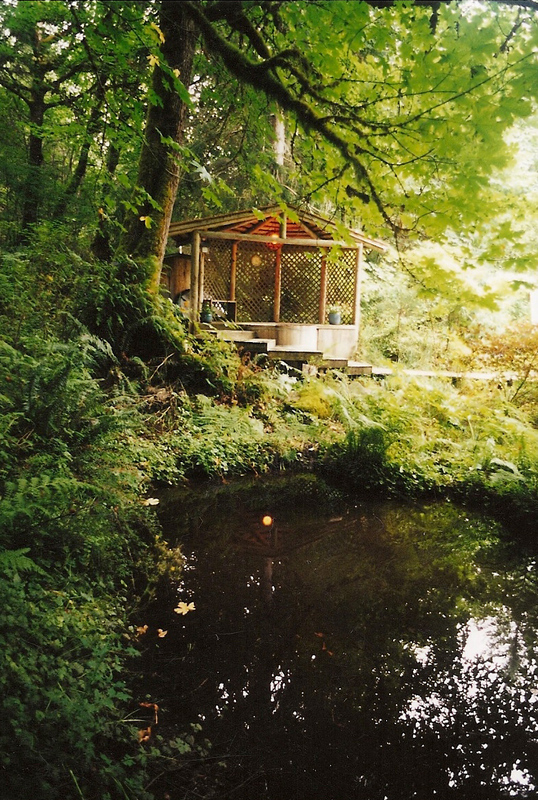 Often, at dusk, you'll hear an owl that lives nearby and comes to visit the pond. 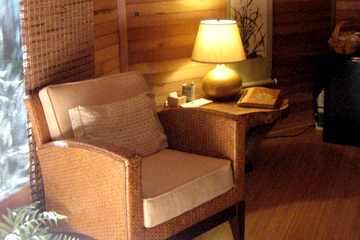 As part of The Woodland Spa, and adjacent to the massage room, this restful space invokes a strong feeling of oneness with its natural forest surroundings. 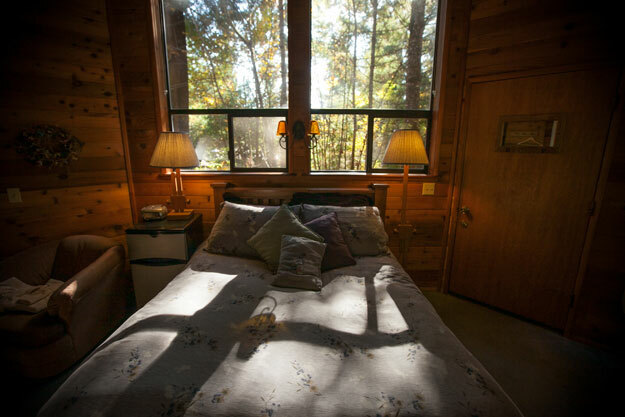 Outside, the sound of falling water and a forest pond; inside, the comfort of a queen feather bed. 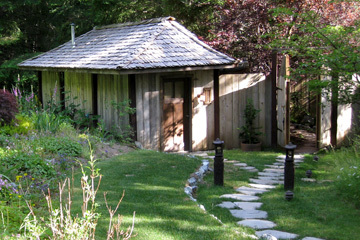 Depending on spa schedules it may be necessary to share the bathroom between 11:30am and 9pm. 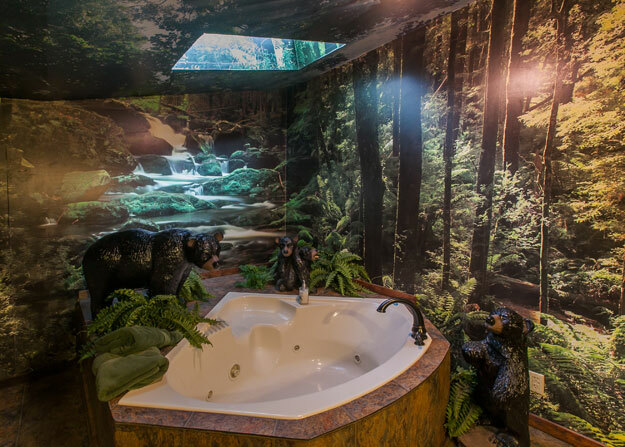 Between 9pm and 11:30am, Grace West guests enjoy exclusive use of the bathroom, hot tub, and sauna. 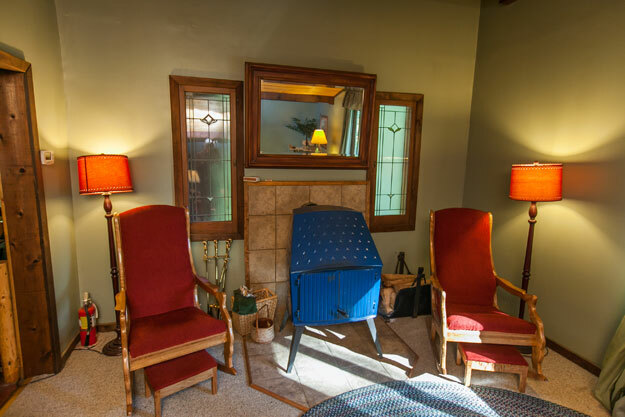 Schedule massages right in your suite. 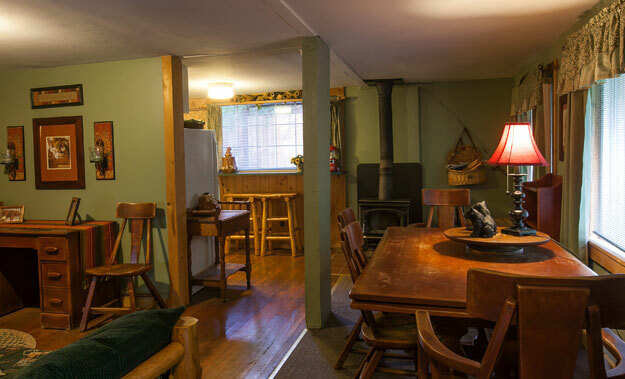 $155 per night plus tax ($175 as of 5/1/19), includes coffee maker, microwave, bar-size-fridge and simple dishware. 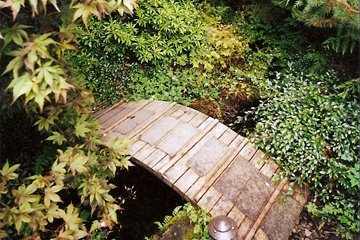 Turiya, the state of ultimate harmony. 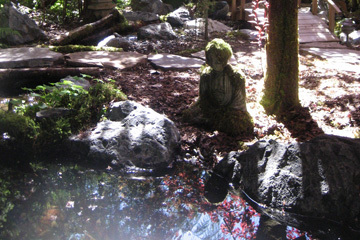 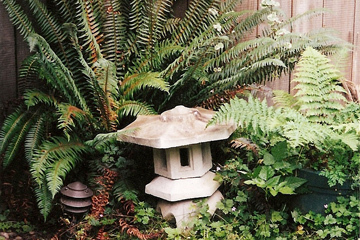 You will delight in this peaceful space—a private Zen garden with waterfalls and pools at your door. 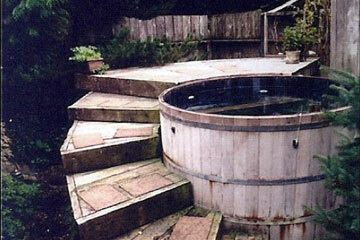 All of this and the hot tub & sauna are exclusively yours between 9pm all night until 10:30am! 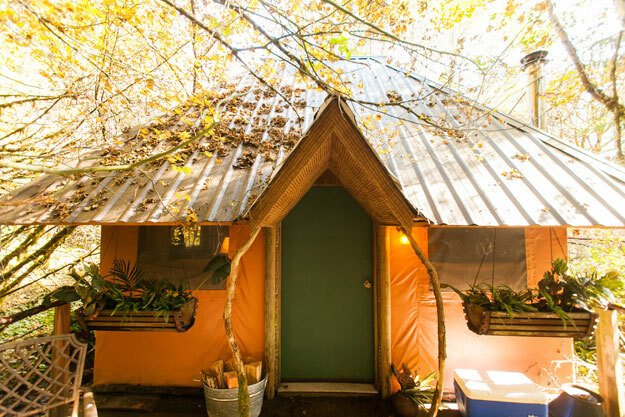 Add massages in the greenhouse for the perfect package. 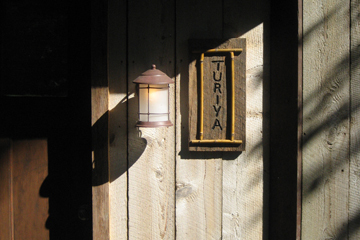 Try Turiya for a magical experience! 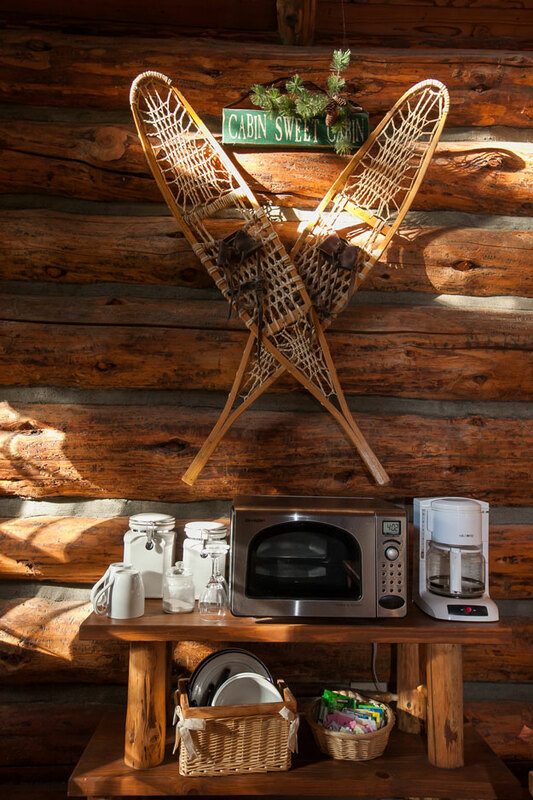 Queen bed, coffee maker, microwave, bar-size fridge and simple dishware,. 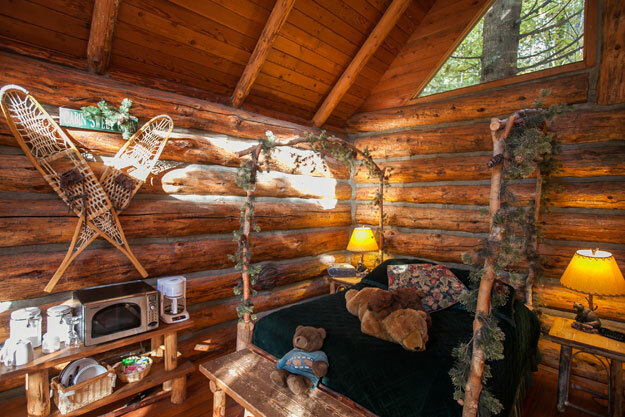 Adults only, $185 plus tax ($195 as of 5/1/19). 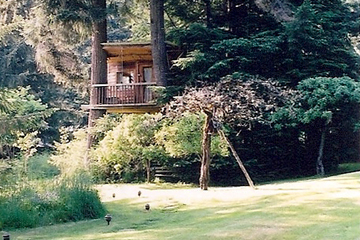 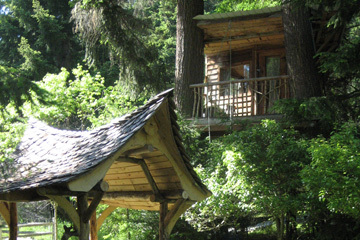 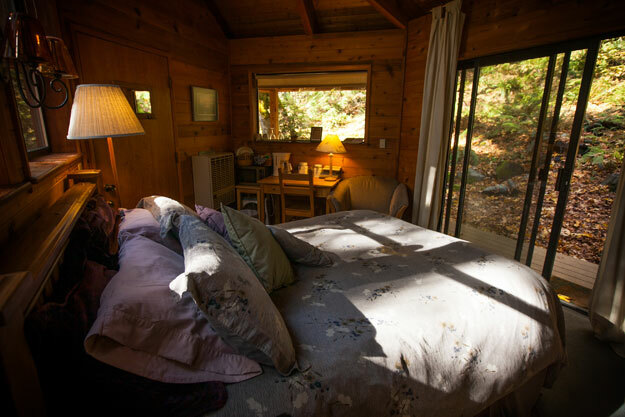 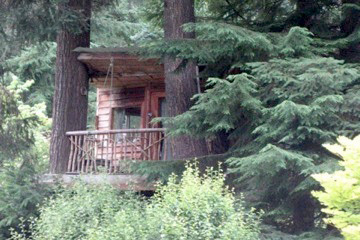 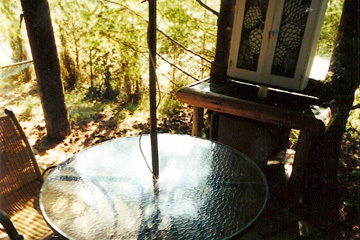 Perched 15 feet above the ground between two large fir trees is our tiny little house built for two. 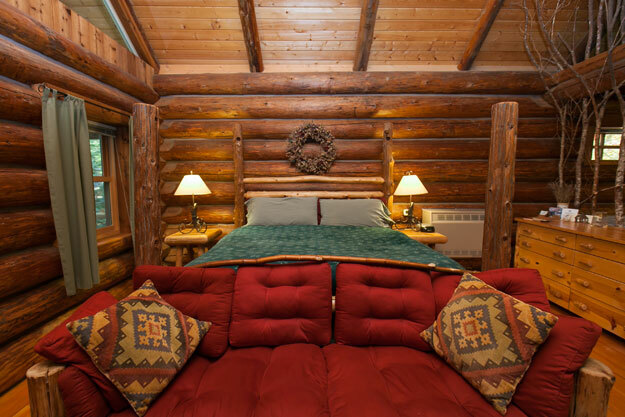 Inside is a queen bed and sitting area. 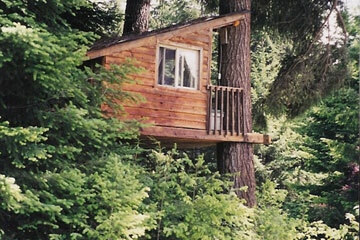 Below, in the skirts of the host firs, is the “green room” with table and chairs, hammock and private bathroom with shower. 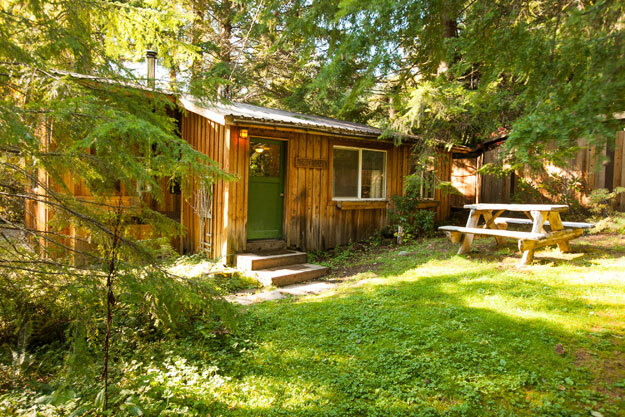 $165 per night plus tax. 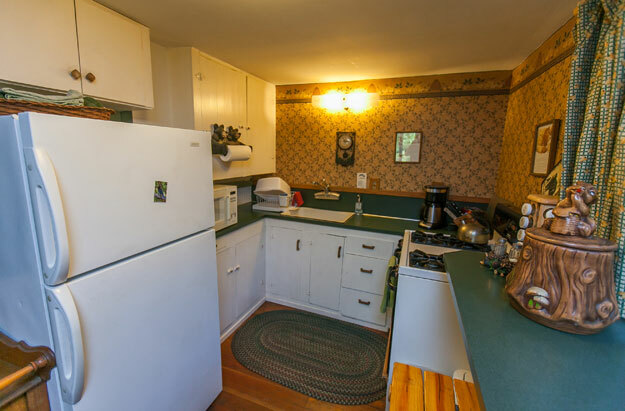 Includes coffee maker, small fridge, and simple dishware. 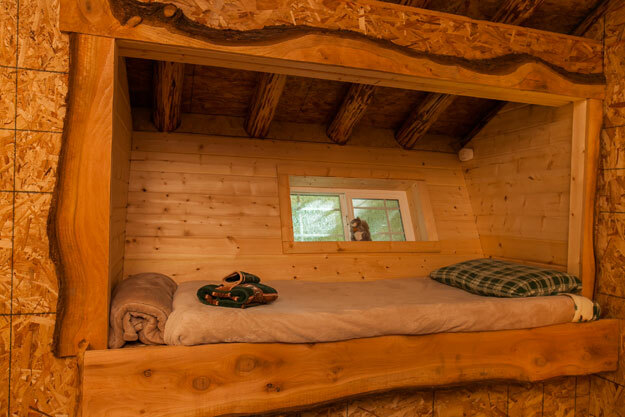 Come bring your best friend for a sleepover ! 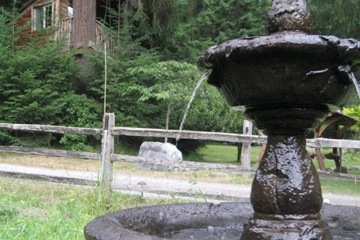 Sorry kids…adults or their inner-child only! 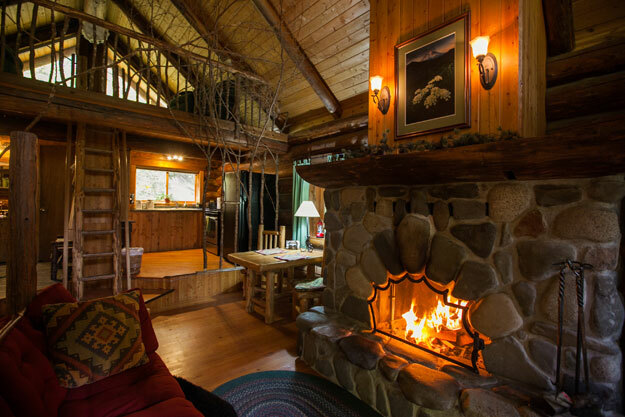 Spacious, comfortable, romantic; you’ll forget Tatoosh isn’t your own home, and then you’ll wish it was. 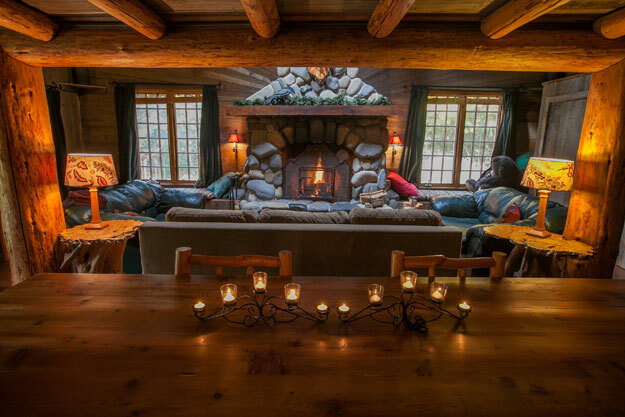 Features a huge stone fireplace at the foot of your king-size sofa-bed, a jacuzzi tub for two with waterfall shower in the bathroom, a fully equipped kitchen with plenty of pots and pans, bake-ware, cook-ware, serving bowls, kitchen utensils and a toaster, and a huge custom built cedar dining table. 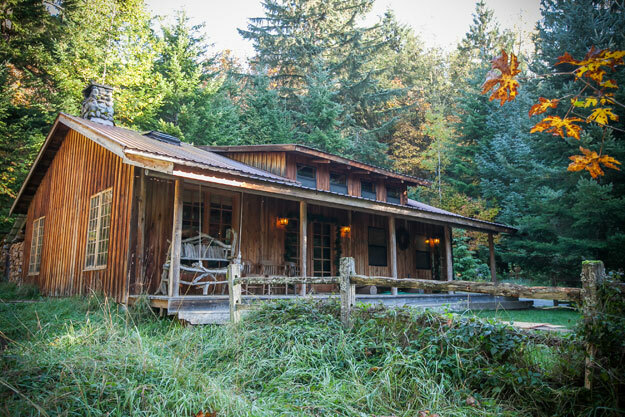 It’s no wonder Vice President Al Gore chose to stay here before he climbed Mount Rainier in 1999! 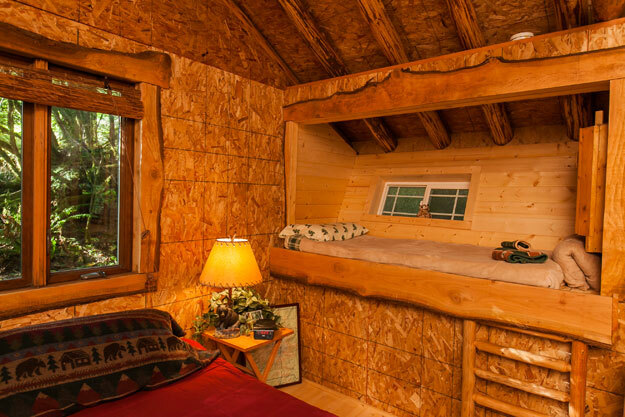 Two almost twin-size window-seat beds for sleeping Secret Service or just your two best friends. 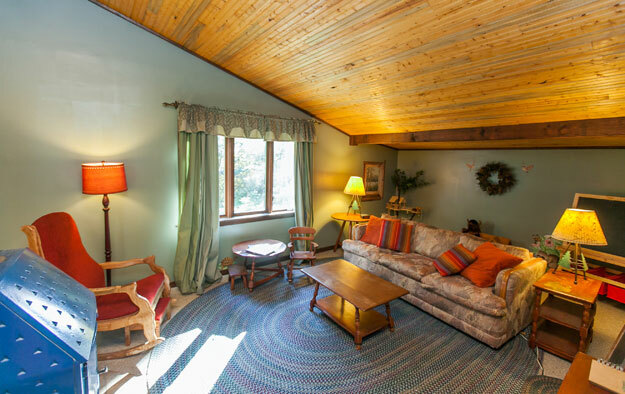 $185 per night for two ($225 as of 5/1/19), $15 per person per night for extra guests. 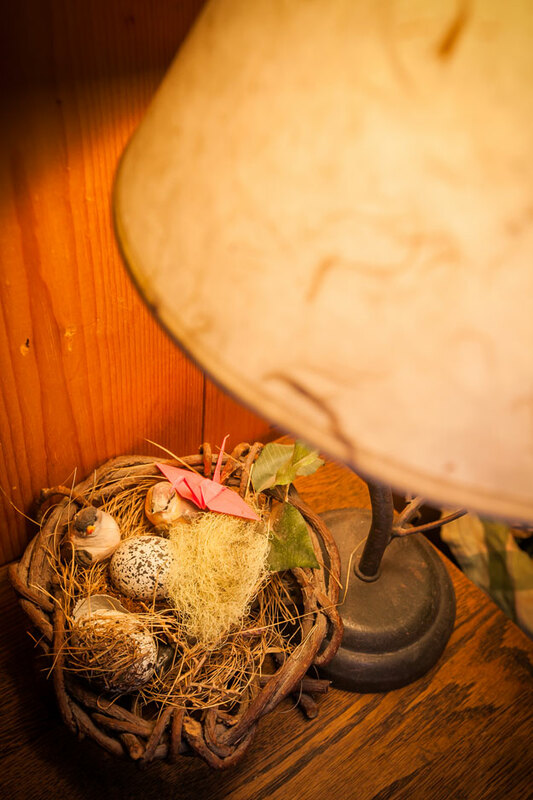 You won’t believe your luck when you come to roost in The Nest. 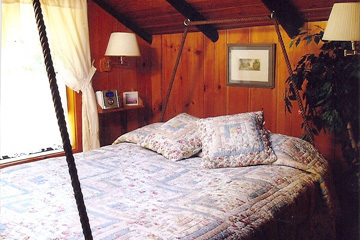 This uniquely romantic little room has all the features of any respectable nest: second-story height, a view of the stars and a snugly feather queen bed suspended from the ceiling. 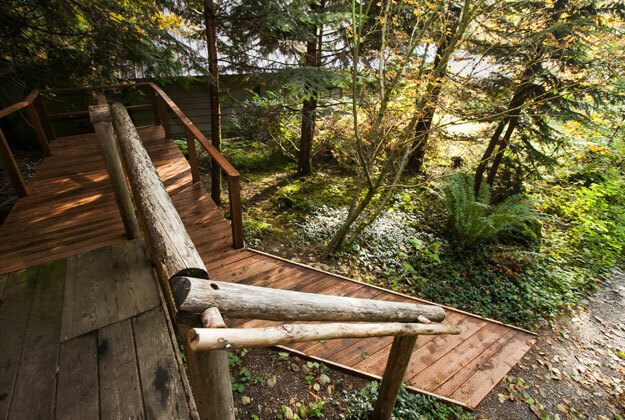 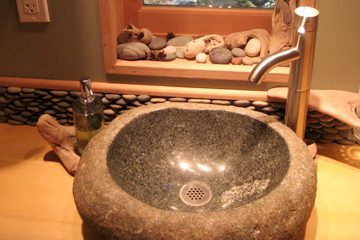 As part of The Tatoosh Lodge building, The Nest has a separate entrance and private downstairs bathroom. 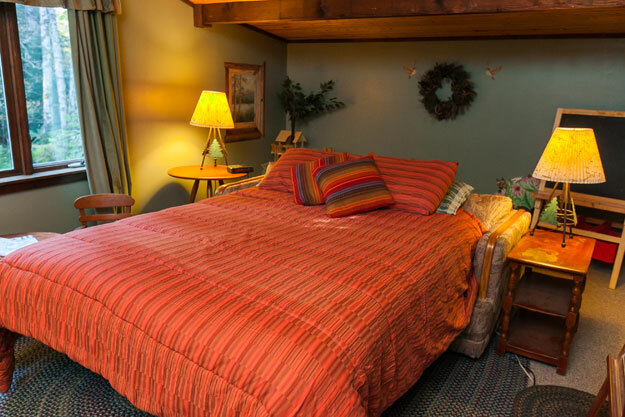 $115 per night ($125 as of 5/1/19) plus tax includes coffee maker, small fridge and simple dishware. 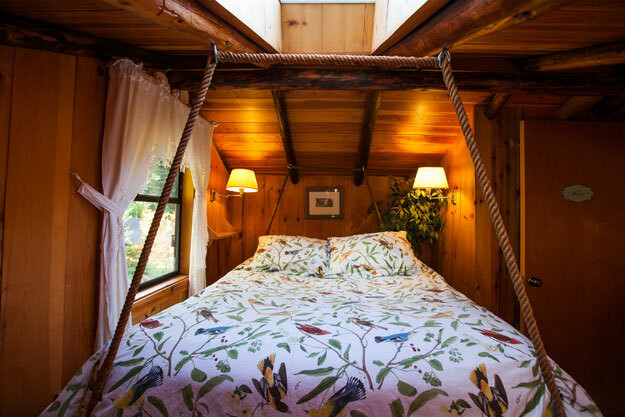 Only space for two lovebirds. 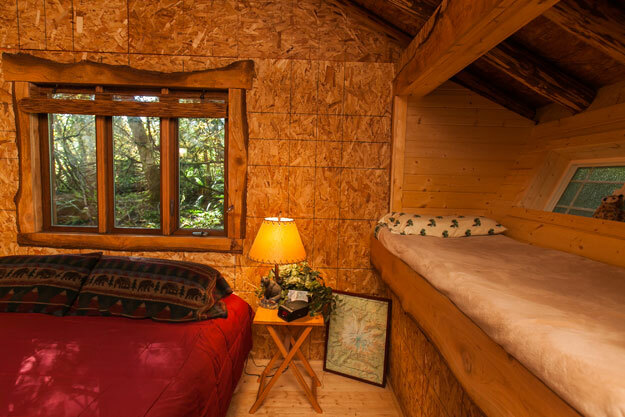 This accommodation starts with The Tatoosh Room and adds another bathroom and the upstairs loft that sleeps eight people in cozy twin beds. 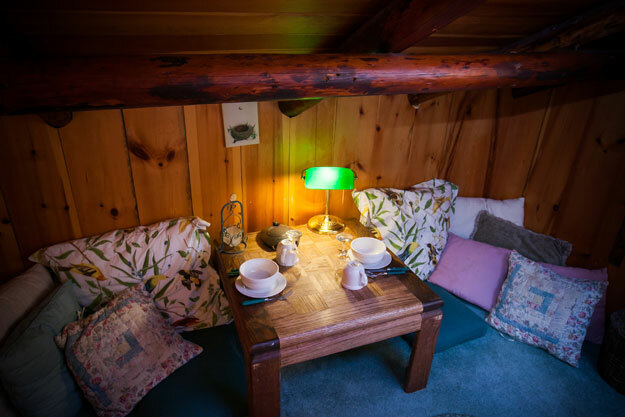 Although downstairs you may sip wine and feel like a grownup, under your covers upstairs you and your loft-mates may succumb to the giggles as you stretch out the day under the light of bedside reading lamps. 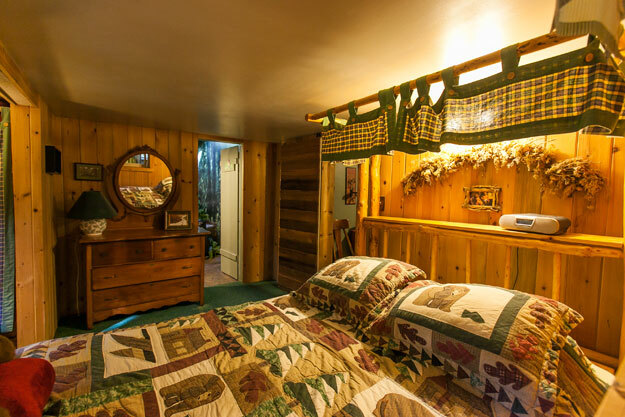 $475 per night plus tax ($495 as of 5/1/19), maximum occupancy is twelve. 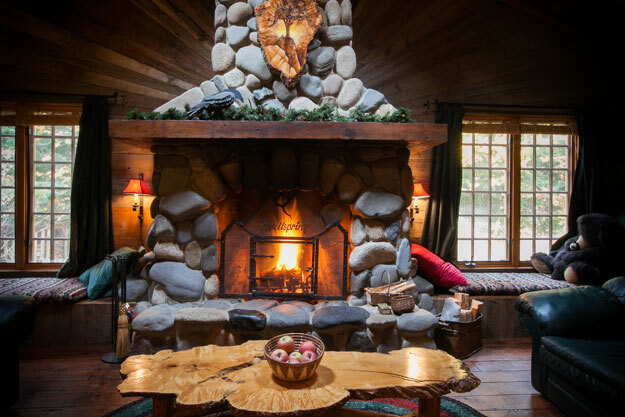 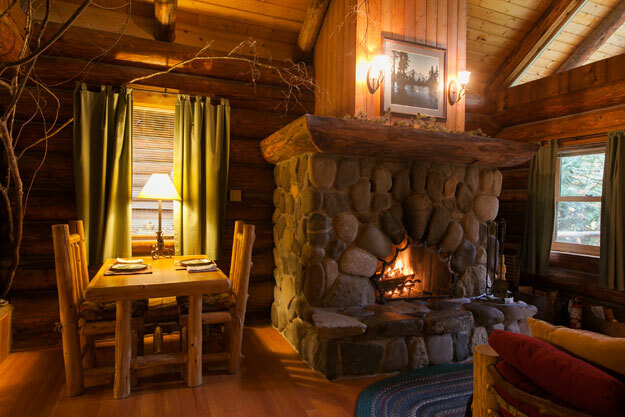 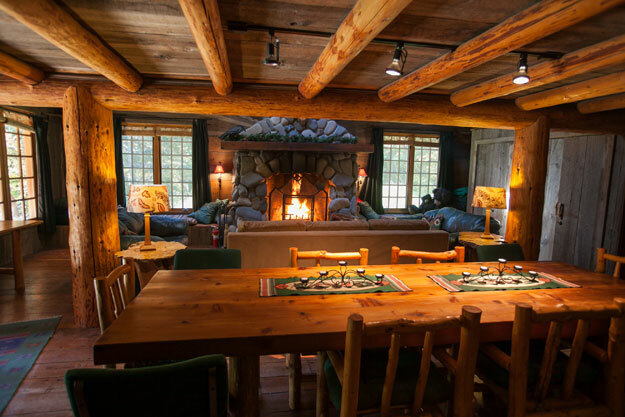 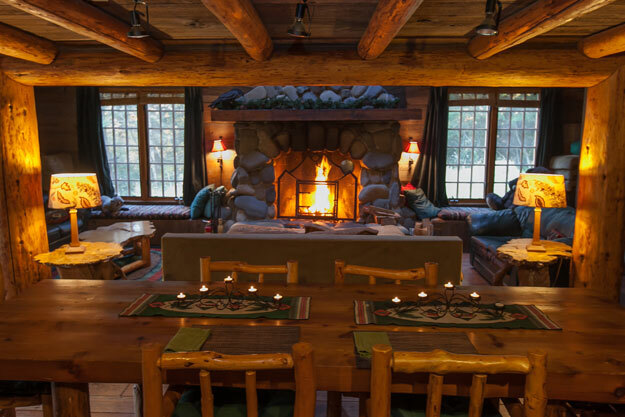 Our largest single accommodation, you may reserve the entire Tatoosh Lodge. 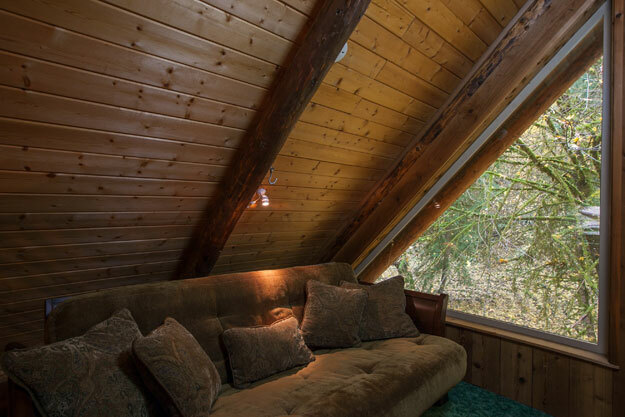 Included are The Nest, The Tatoosh Room, and the Loft. 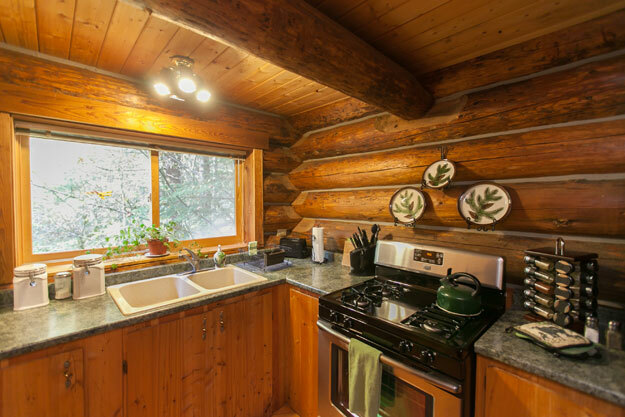 The full kitchen has plenty of pots and pans, bake-ware, cook-ware, serving bowls, kitchen utensils and a toaster. 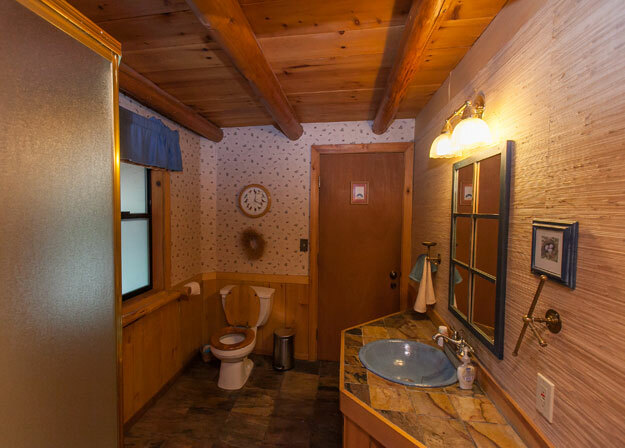 There is two bathrooms. 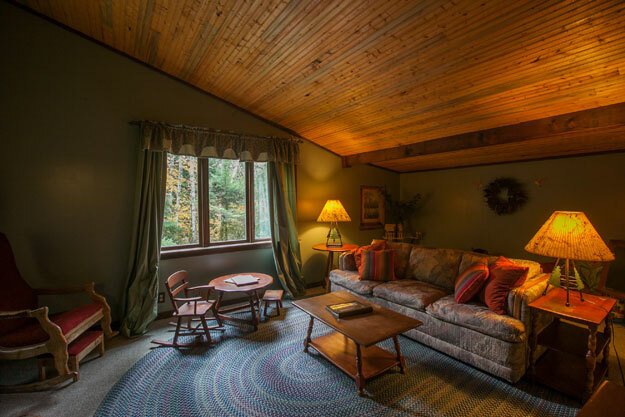 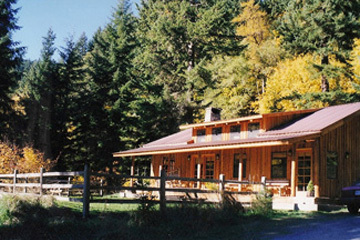 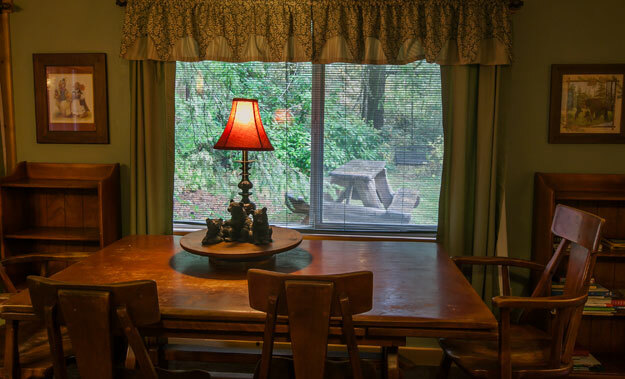 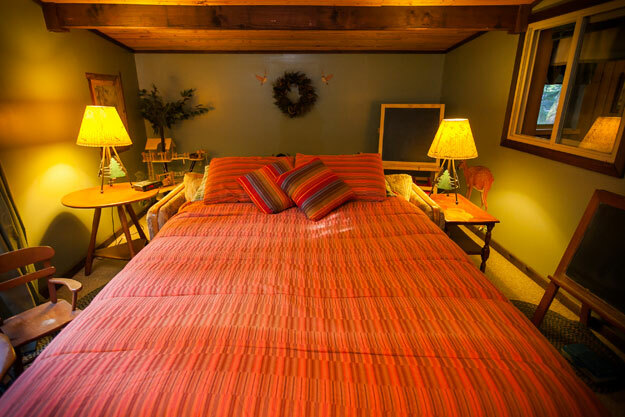 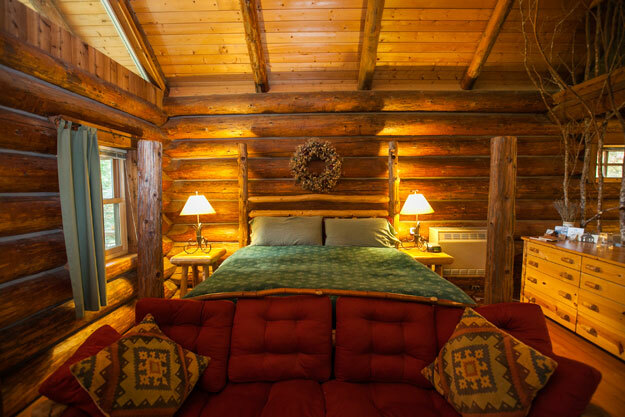 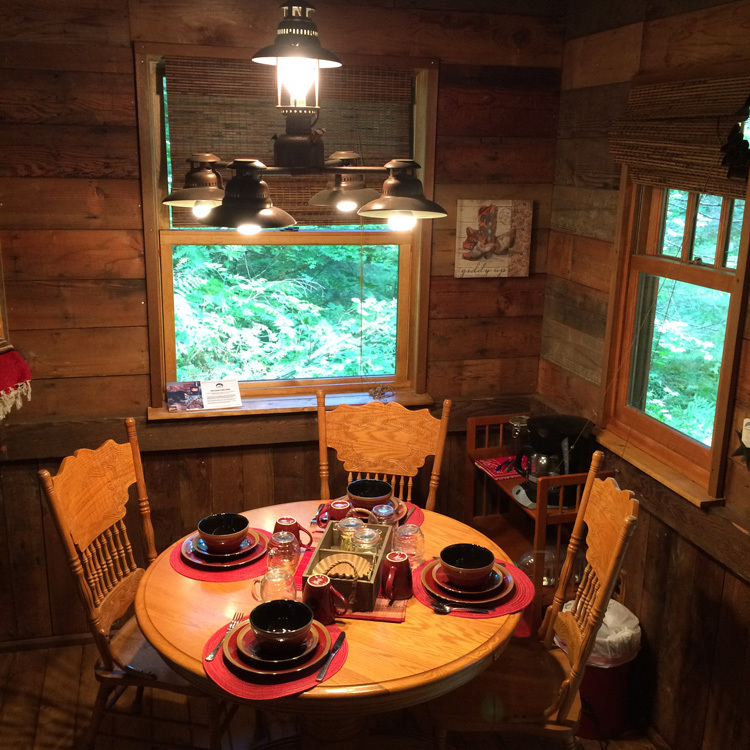 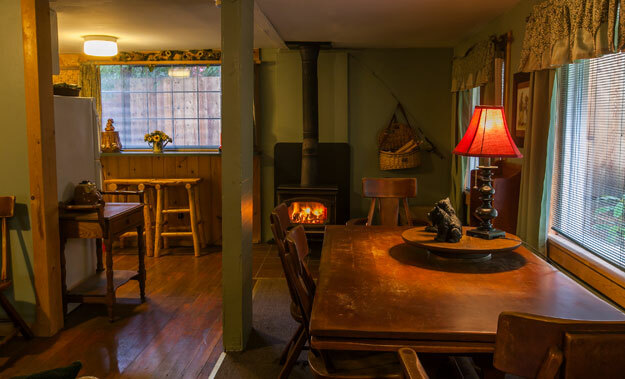 At $575 plus tax ($595 as of 5/1/19), the Lodge comfortably sleeps 12 adults plus 2 children, perfect for a family reunion, a women’s group, book club, or quiet retreat for favorite friends. 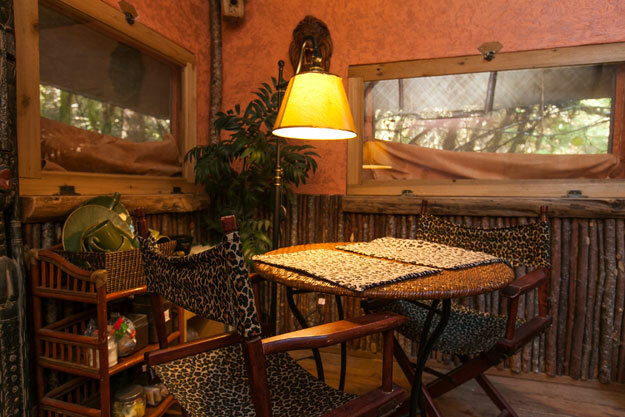 Timbuktu is one of our CAMPER CABINS. 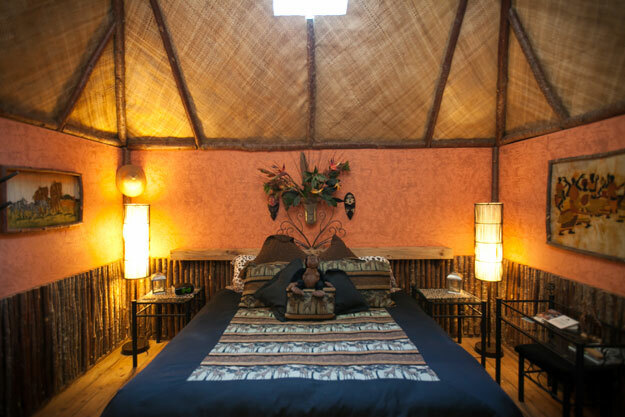 This romantic African safari “hut” is well appointed to keep you comfortable while you’re out in the bush. 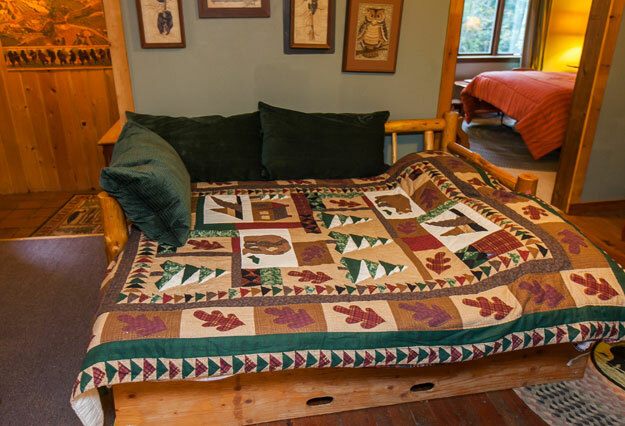 Can be set up with two twin beds or one Savannah king. 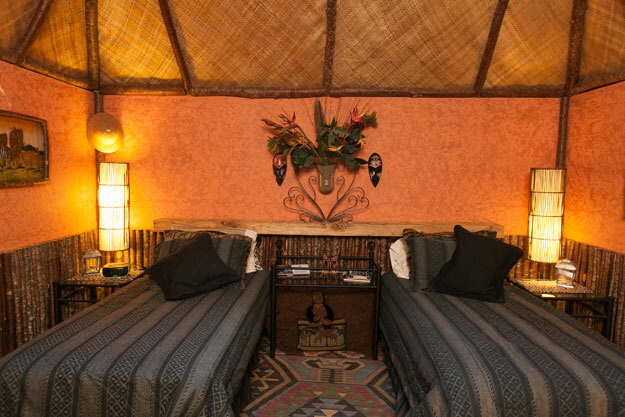 Roar like a lion, lounge like a lizard, or just monkey around; your wild side will love a night in Timbuktu. 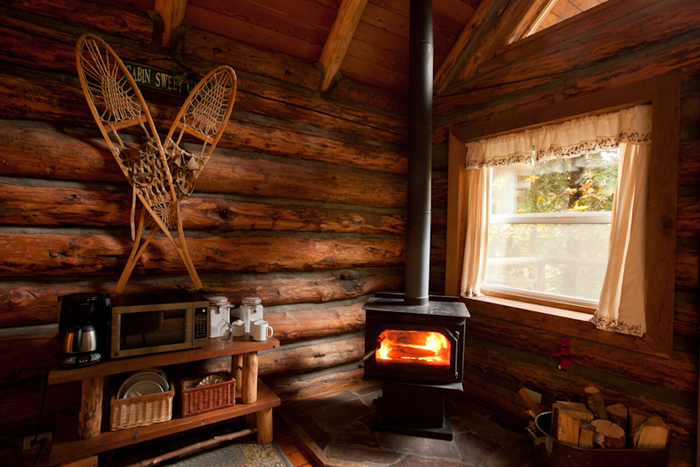 Wood stove keeps you cozy and warm. 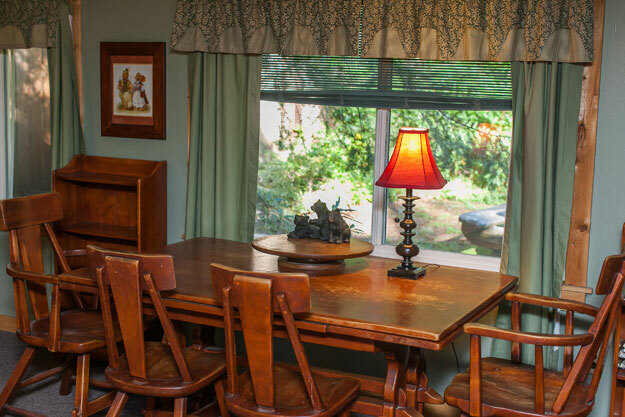 Simple dishware and coffee maker provided. 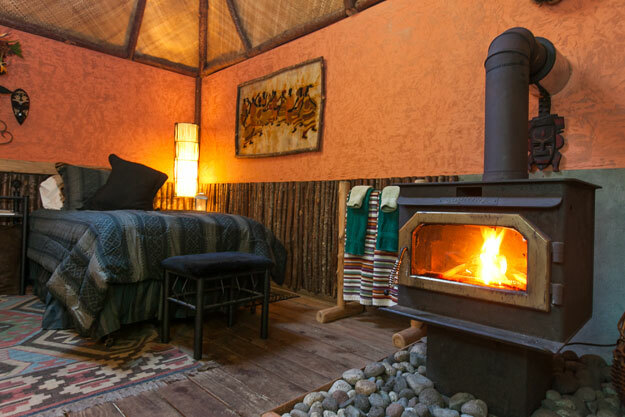 $95 for two adventurers ($105 as of 5/1/19). 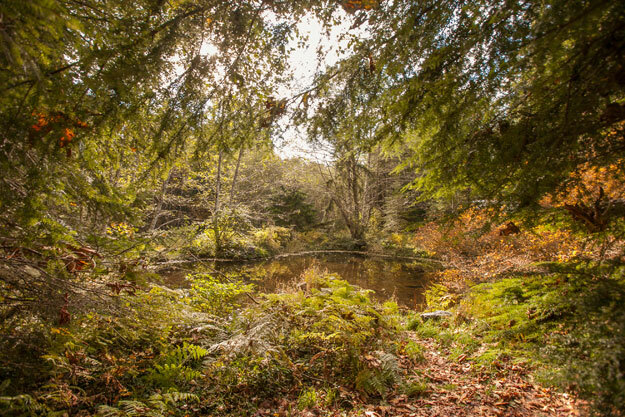 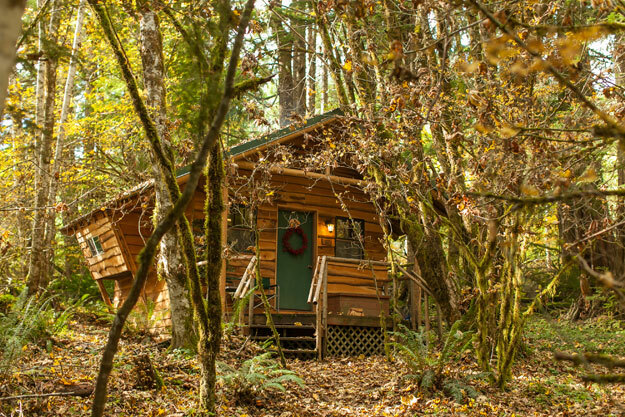 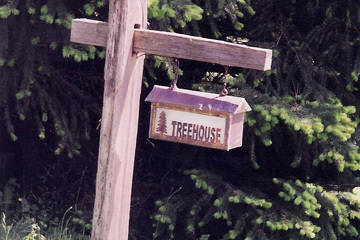 Heads up: our CAMPER CABINS are located in a quiet forested area about a 3-4 minute trail walk away from shared bathroom facilities and parking. 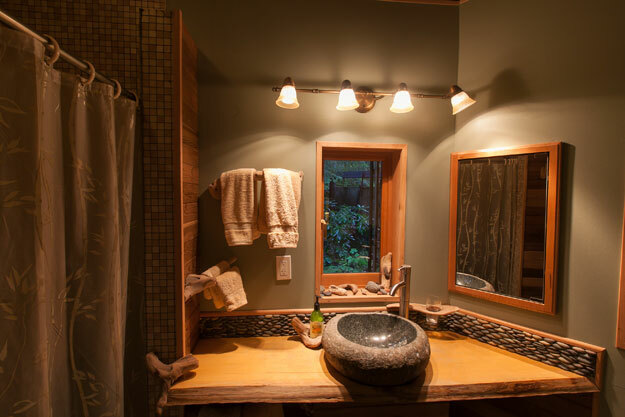 Bathrooms include showers and a bar-size fridge. 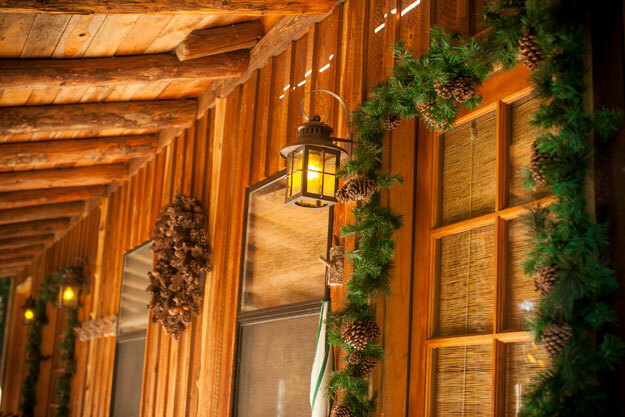 There is also an ice chest on each of the front porches of the Camper Cabins but please bring your own ice if you plan to use it. 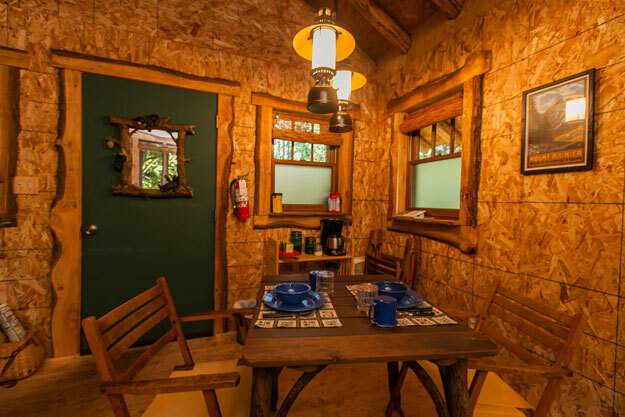 Trail’s End is one of our CAMPER CABINS. 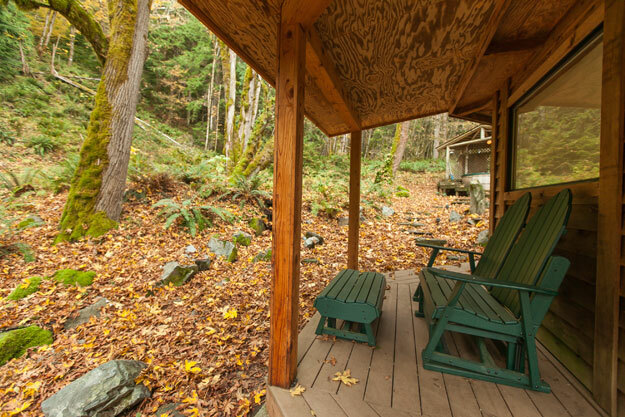 Quiet, peaceful, private, Trail’s End makes a cozy hideaway for two, or an adventurous family base camp. 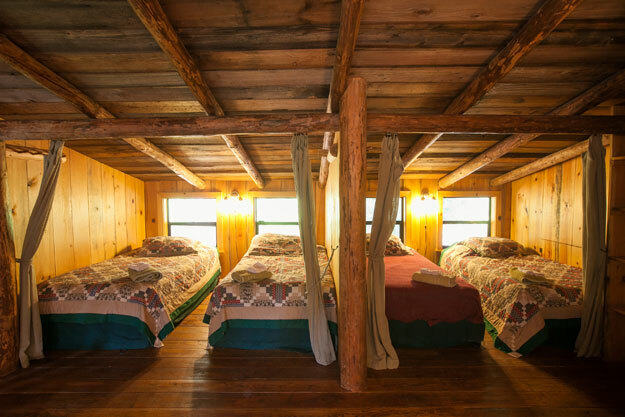 Can be set up with two twin beds or one king, and two camp bunks available for the kids. 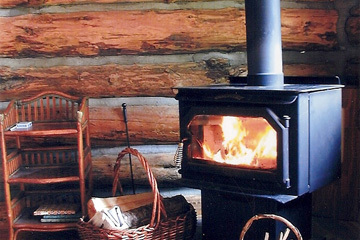 Wood stove keeps you cozy and warm. 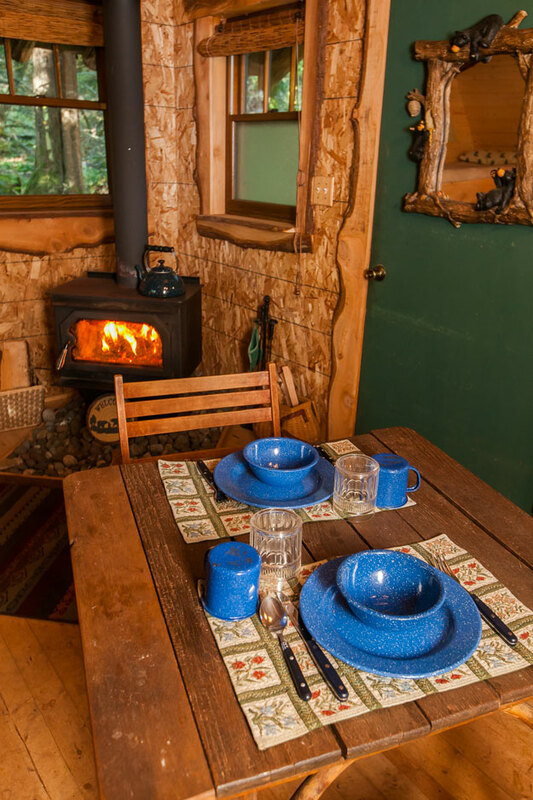 Coffee maker and simple dishware provided, nature games provided and a 1-mile nature trail right out the door. 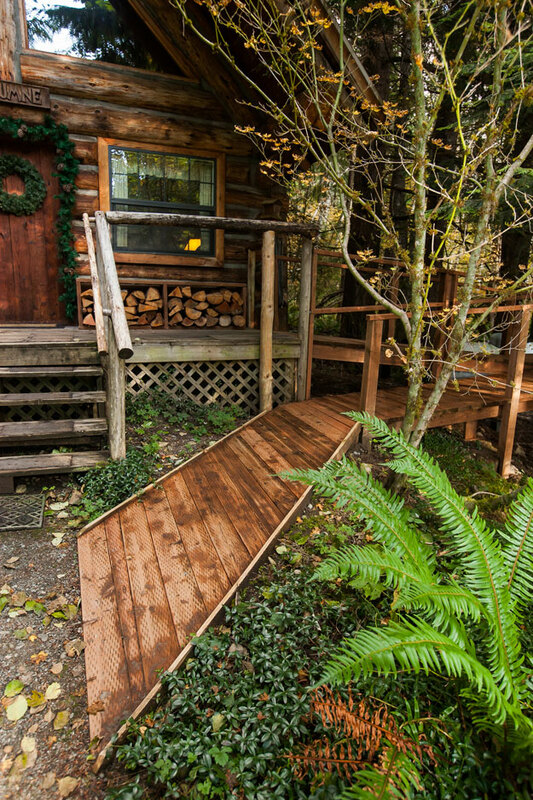 Come explore! 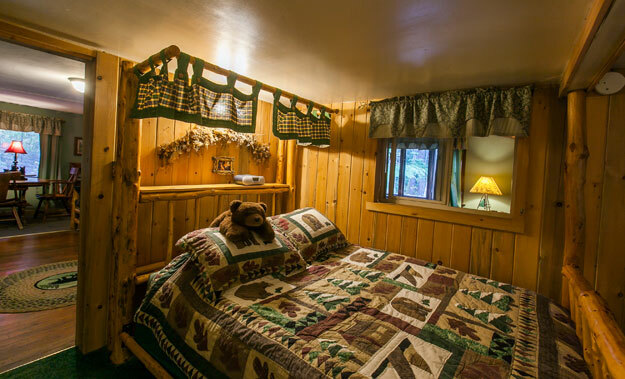 $95 for two hibernators ($105 as of 5/1/19), $5 for each additional little camper. 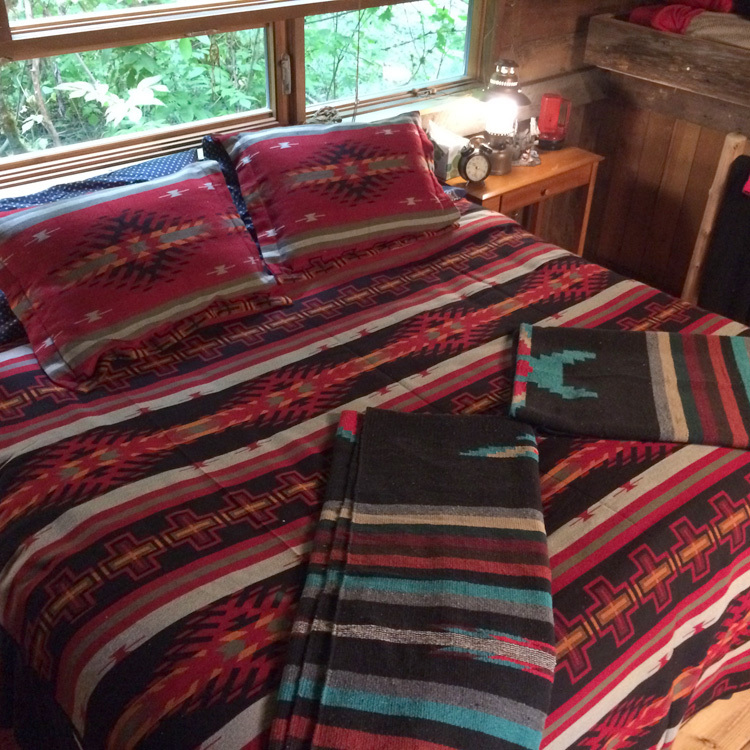 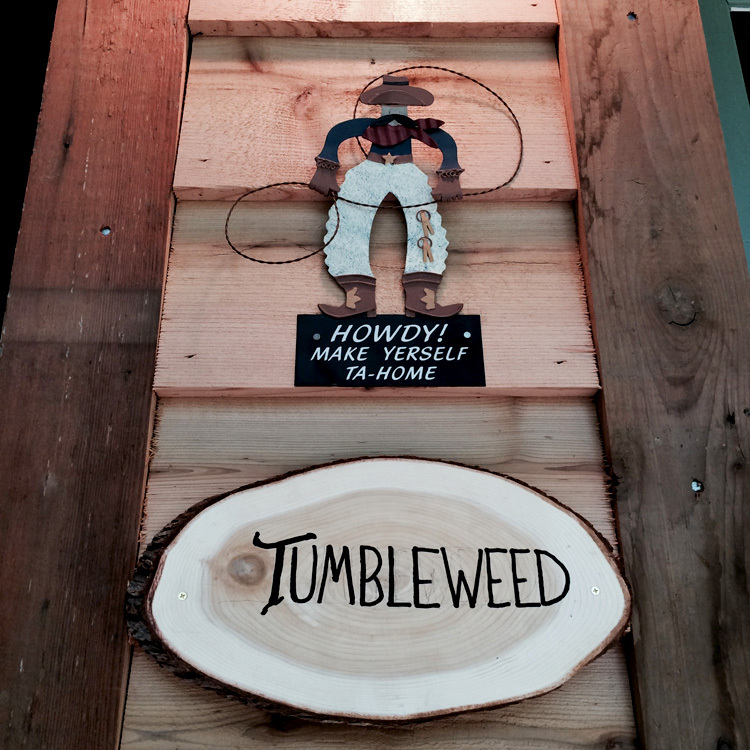 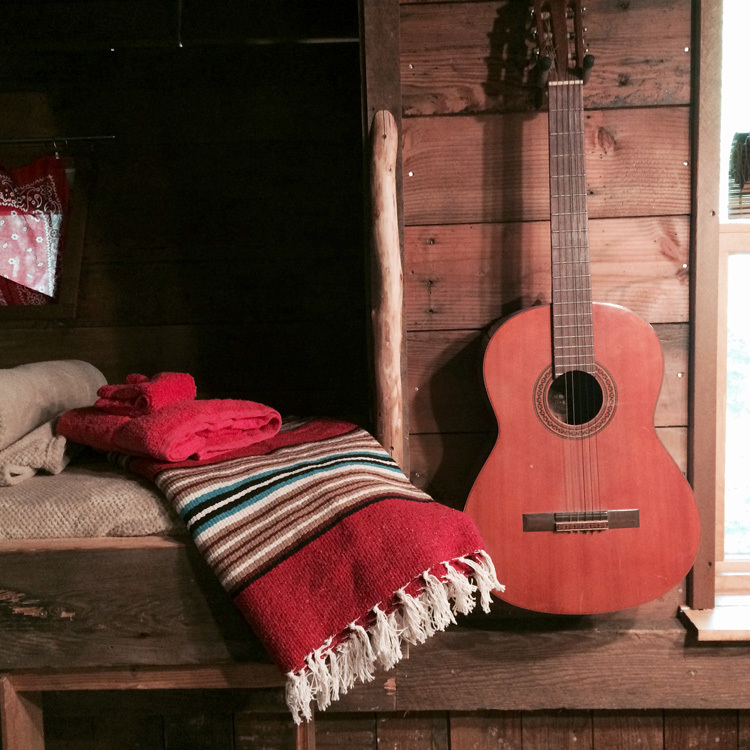 Tumbleweed is our newest CAMPER CABIN. 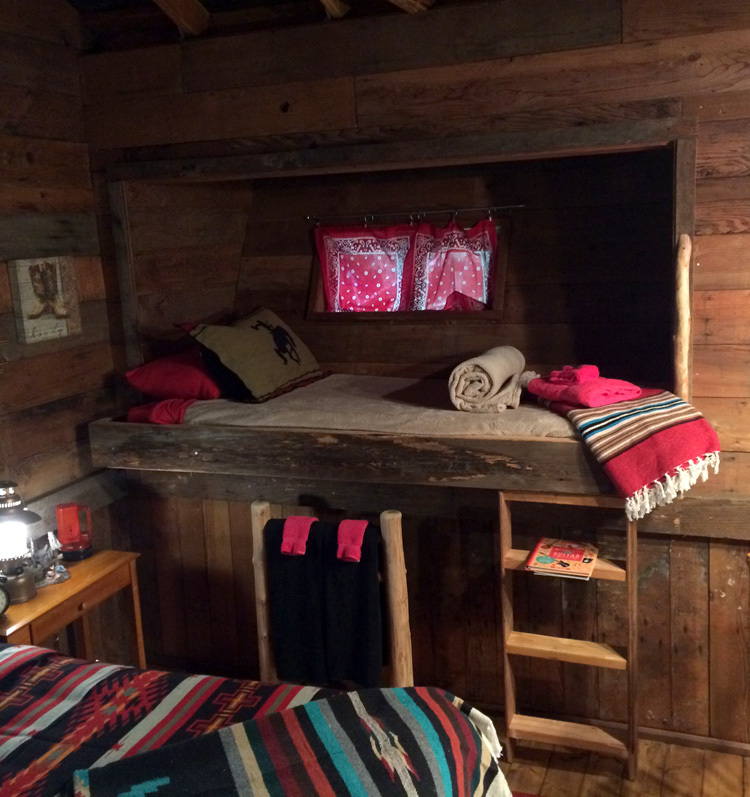 Rustic in just the right ways and cowboy to the core. 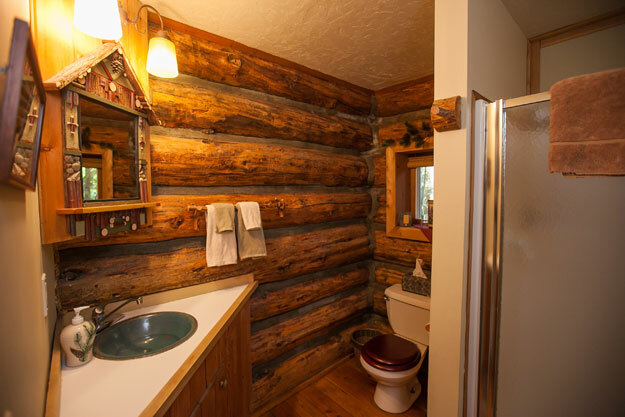 Even the kleenex box has boots on it. 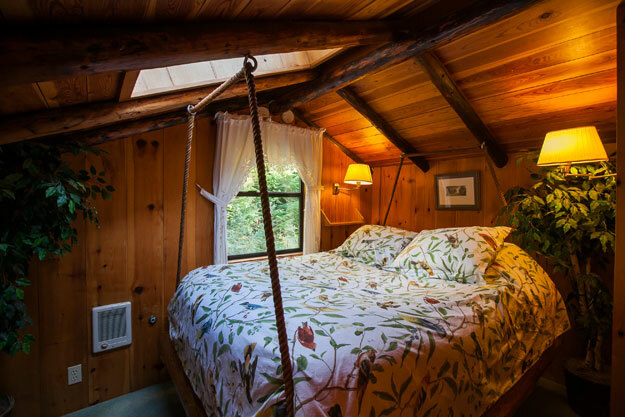 A perfect hideaway for you and your partner to lay low. 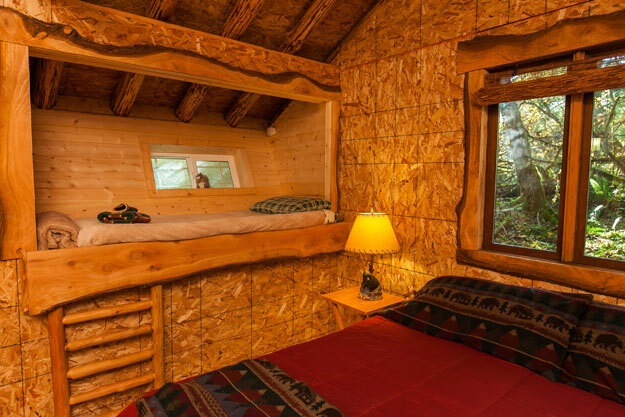 Can be configured with two twin beds or one king, and two camp bunks for 2 kids. 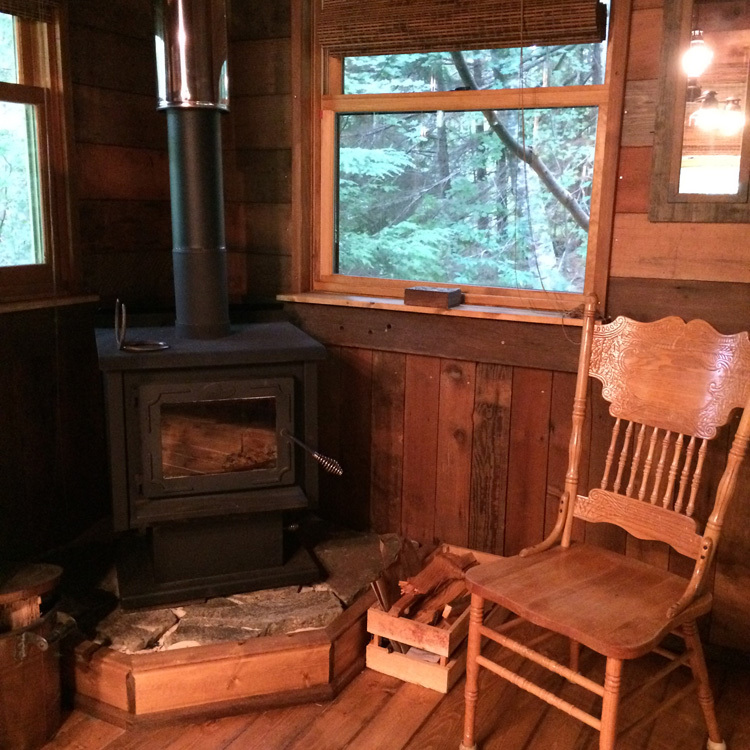 Wood stove keeps you cozy and warm. 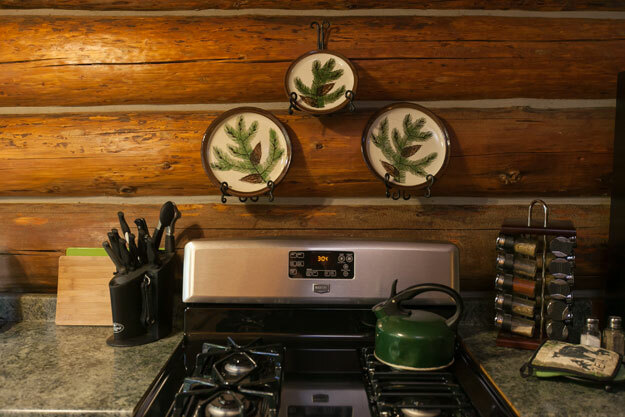 Simple dishware provided, coffee maker too. 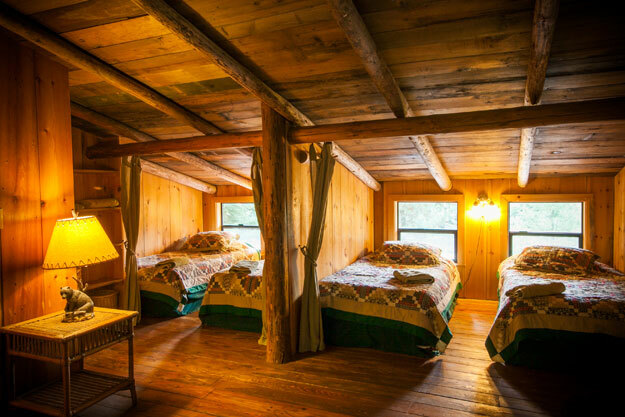 $95 for two ($105 as of 5/1/19), $5 for each additional little cowboy.